The occasion was the Awards for primary school leaders who had been put forward by the principals of all the primary schools in Porirua because they demonstrated service above self (one of Rotary's mottos) and leadership and were a role model in their schools and in the community. The Performing Arts Studio at Pataka was filled with proud principals, parents, whanau, councillors, college prefects and honoured guests. Mayor Nick Leggett presented each student with a certificate and Deputy Mayor 'Ana Coffey and Councillor Bronwyn Kropp pinned a Rotary badge onto each child's lapel. The badge was inscribed on the back, 'Be a gift to the world' for that is what they are. 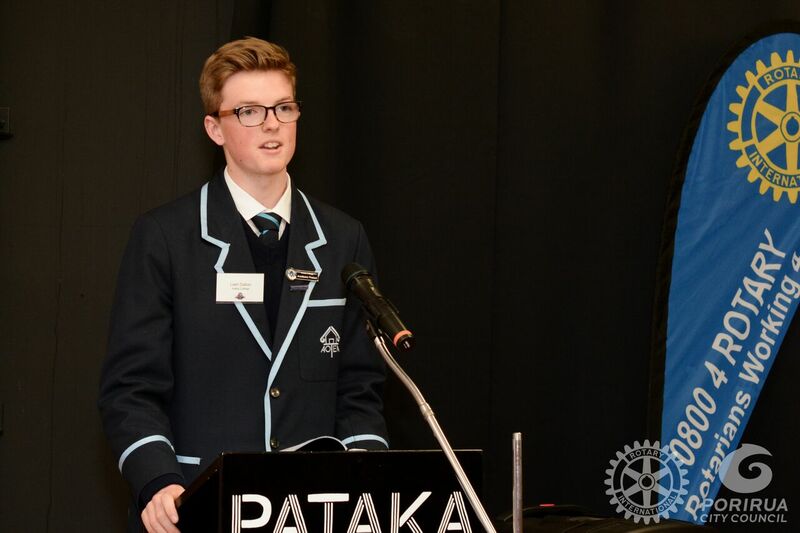 At the start of 2015 Plimmerton Rotary had sponsored Liam Dalton to attend the Rotary Science and Technology Forum in Auckland. He had returned to speak to us about his experience and had impressed us so much then, at the age of 16, that we asked him to speak to the city's young leaders. Thank you Rotary for inviting me to speak to all of you and congratulations to everyone who has received an award this afternoon. My name is Liam Dalton and I am a year 13 student at Aotea College. This year I was chosen to be the academic prefect for the school and so a lot of the work I do has been to encourage academic success in students like yourselves and to help get greater recognition for students who demonstrate hard work both in and out of school. In January this year I was chosen by Plimmerton Rotary to attend the National Youth Science and Technology Forum at Auckland University, so alongside 180 year 12 students, we gave up some of our summer to experience the university life and learn more about the importance of science and technology in New Zealand. This trip taught me so many things about myself, about leadership and about success. So I am here today to talk to you, very briefly, about some of the things I experienced. So going up to Auckland I experienced this mixture of utter fear and excitement that is really difficult to explain. I hadn’t exactly socialised in this kind of way, or on this scale before and it felt like the first day of college all over again. To make it even scarier I knew absolutely no one else, nobody on the plane and certainly nobody in Auckland. It was the most daunting fear but I knew that I had to do everything in my power to overcome the instinct to stay quiet and hide away. I only had 2 weeks there, and although that seems like a long time, it disappears pretty fast. So, 2 weeks to make lifelong friends and experience university. What I quickly learnt was how important it is to force yourself to open up to people; and I do not mean “Tell everyone your deepest secret on the first meeting” but I mean biting the bullet. You need to push aside any fears you might have when meeting new people and be confident in yourself. Being able to talk to someone new, to hold a conversation, to smile and ask questions is one of the most valuable skills you will learn. It gets you recognised, it helps you to make really strong friendships and connections with interesting people. Not only this but it means that you have the courage to step forward and seize an opportunity, to take a risk and reap the rewards when all goes well. The first few times are always the most difficult, sometimes conversations simply fail and become a little awkward, but that’s ok! The sooner you start having these kinds of conversations the quicker you will learn to make them work for you rather than against you. The science forum was extremely testing in this way and helped me grow significantly in this area. Without it I would not have the courage to express myself at interviews, speak at meetings or to attend events such as the Model United Nations. Nor would I have the courage to speak in front of you today. As you can probably see I am still trying to master the act of not letting my face go bright red, but it is a work in progress, there is always room for improvement. Now, the second thing I learnt is possibly the most important and something I want you all to remember when you go off to college. And it is that school is not the only place you learn, and that grades do not reflect all forms of intelligence. As academic prefect I actually get quite angry when I see my friends get upset because they didn’t get the perfect grade and when they feel like they are somehow unintelligent because they got a merit instead of an excellence on a test. What I want you all to remember is that grades are only a small part of a much larger picture. Now this forum was nicknamed “nerd camp” and sure, what would you expect? A bunch of science students choosing lectures over summer!! I get there expecting to be completely out-nerded by child super brains, but what surprised me was that I found the exact opposite. These people were mostly normal! And the more I talked to these people and spent time living with them, I came to realise that not one of them had the perfect grades. Yes there were many there who are extremely talented, but what distinguishes them from your normal ‘excellence’ student is that they have a passion to find opportunities and a desire to learn through experiences, and not just from a text book. A smart mind means nothing without a passion to push it. A smart mind needs to be married with sports and culture and music and leadership, we learn just as much from the experiences we immerse ourselves in each day as we do at school. What I regret is that I feel like I realised this too late, I would wish nothing more than to go back and say “Yes” to the opportunities I once turned down as a kid. So as you head off to college next year, remember that grades are not the be all and end all. I encourage you to work your hardest and to test yourselves, but remember that at the end of the day there is a whole world of opportunities waiting for you, you just need the desire to seek them. All of you sitting here, receiving your awards, are showing that you have taken the first step to becoming the intelligent and passionate leaders I’ve been talking about. You have proved to everyone that you can be a role model, that you can be a leader and that you demonstrate service above self, all critical qualities that every leader needs to have and exemplify. With college on the horizon there will be many changes to come. It is a big adjustment, moving schools, but it is one of the best experiences you will ever have. I want you to not let this change stop you from being the leader you want to be and remember that it is so important to step out of your comfort zone, to join clubs and sports teams, to take music and make art, to be kind to everyone you meet and to work hard so you can come out 5 years later and be able to say that you made the most of every minute. Be the change you want to see in the world, and continue to show your friends, your family and your teachers that you are an extraordinary human being. Every single one of you can make a big difference to someone's life, whether it is one close friend, a total stranger or a large community, remember your importance and how valued you are to those around you. Keep being awesome. Once again, congratulations to all of today’s award recipients. Original generation time 1.3815 seconds. Cache Loaded in: 0.0006 seconds.